Wilfried Bony has thanked Swansea City and the club's fans after signing for Premier League rivals Manchester City. The Ivory Coast striker, 26, has agreed a four-and-a-half-year deal at Etihad Stadium in a deal that could be worth up to £28m for the Welsh club. Bony joined Swansea for a club-record £12m from Vitesse Arnhem in 2013 and scored 34 goals in 70 games for them. 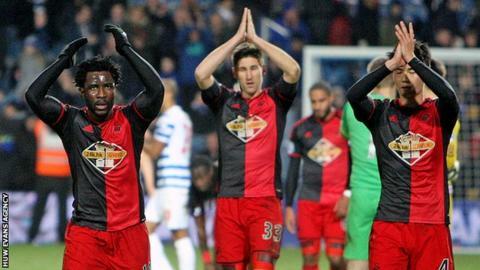 "I'm going to really miss Swansea - the club and its people," Bony told the Swansea website. "But it's a big challenge that I had to take, one I'm excited about. "I'd like to thank everyone at Swansea from my playing colleagues, the coaches, medical team and the kit staff through to the chairman [Huw Jenkins], who has been great with me. There are too many people to mention. "The fans are up there at the top, though, because they've also supported me from the very first day I arrived, even when things weren't going so well for me. "They've kept singing my name at the Liberty which has meant so much to me. "They would even sing the Wilfried Bony song when I walked down the street, which is unbelievable. We would have a good joke about it. "I only have good things to say about life in Swansea and the people because they've always shown me warmth - on and off the pitch. I'm going to miss everyone." Swansea and Premier League champions Manchester City agreed the terms of the transfer at the weekend, with £25m cash up front and a further £3m in performance-related add-ons. The deal makes Bony one of the most expensive African footballers in history. Bony is on international duty with Ivory Coast at the Africa Cup of Nations and could potentially have to wait until mid-February before he can make his City debut. But the striker maintains that south Wales was the right place to start his Premier League career. "I still believe that Swansea was the right club for me to join when I left Holland for the Premier League. I have no regrets, although it's going to be strange coming back to the Liberty to play against Swansea," Bony added. "But now was the right time for me to gain more experience and challenge myself with Champions League football and to try and win trophies. "I have spoken to the coach [Garry Monk] today and he has wished me good luck for the future. I would also like to thank him, not just as the coach but also when he was a player last season, because he has helped me a lot. "I will also speak to Ash [Swansea and Wales centre-back Ashley Williams] later to thank him as captain and to pass on my gratitude to the rest of the squad. "It's a good squad that will continue to do well this season. I have no doubts about that."